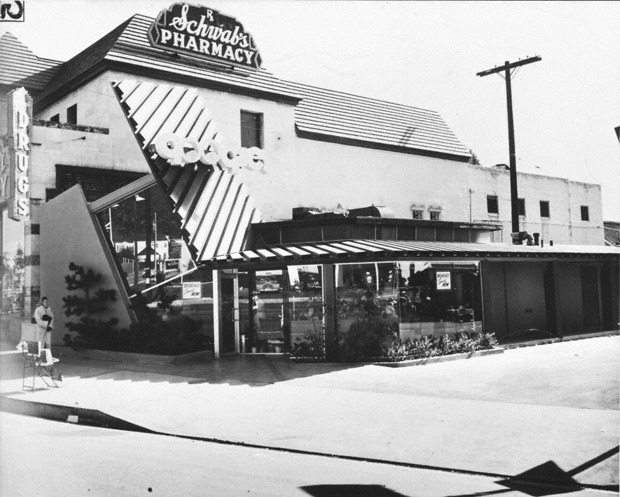 On the corner of Santa Monica Blvd & Crescent Drive in Beverly Hills sits "Jack Colker's 76" gas station, one of the best examples of what is known internationally as "Googie" architecture. According to this wikipedia article Googie architecture originated here in Los Angeles and was based on the car culture and optimistic Space and Atomic themes of the 1950's and early 1960's. In addition to roofs slopping at an upward angle and large glass windows, buildings featured boomerangs, flying saucers, atoms, starbursts and parabolas in the designs. The name "Googie" was based on the Googie's Coffee Shop located on the corner of Sunset Blvd & Cresent Heights here in Los Angeles. When Yale University Professor Douglas Haskell saw the building on a visit to L.A., he ordered his car stopped and proclaimed, "This is Googie architecture." The name stuck. The 76 Station in Beverly Hills is one of the best existing examples of Googie architecture here in Los Angeles. It's curved roof was was originally designed in 1965 for LAX by world-renound architect William Pereira. Looks like something out of the old cartoon series "The Jetsons" (remember that show?). When Pereira's design wasn't needed at the airport, it ended up as a gas station. LAX's loss becoming Beverly Hill's gain. This is so much Los Angeles! Excellent! I have tried very hard to find a photo of the very famous "googie" coffee shop in Los Angeles, but I am not successful. Unfortunately, I have not been able to ever find any photographs of the famous "Googie" coffee shop that this style of architecture is named after. Very ironic. If I ever come across anything, I'll be sure and post it. Proud to say that this gas station was designed by my father, Gin Wong, who was a designer at William L. Pereira and Associates at that time, later Director of Design and then President of the company before starting his own firm, Gin Wong Associates. This was one of his first designs after graduating from the USC School of Architecture.